Save time by readily identifying checklist tasks that correspond to documents you are working on. This article will show you how to utilize smart checklists on your transactions. This feature works best when you have enabled checklist scrolling. Click "Enable Checklist Scrolling" above the add checklists area. You only need to do this once. Pipeline will remember your choice. Navigate to the transaction and scroll down to the Documents section. When you click a document name and that name matches the name of a task on the transaction, the task will be highlighted. If you have enabled Checklist Scrolling, that task will also be positioned so that you can see it easily. 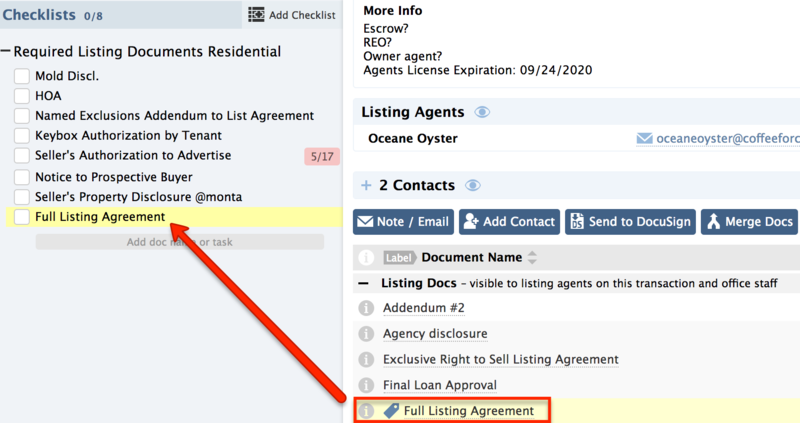 For example, clicking the document: Seller's Property Disclosure will result in the Seller's Property Disclosure task being highlighted. This allows you to quickly locate the corresponding task that needs to be checked off. In order for the highlight to occur, the document’s name must appear completely inside the task’s name. We recommend using Pipeline’s standardized document names feature to help ensure better matching of tasks to docs.